The effect of groundwater pumping on the health of arid vegetative ecosystems is examined herein. It is clear that plants and wells are in competition for the groundwater resource. The competition is most critical in arid/semiarid regions, where surface water is scarce and groundwater is the only recourse. Developed shallow groundwater systems generally result in the lowering of the water table, wherein the greater the capture, the greater the lowering. Lowering of the water table stresses the plants that customarily rely on the groundwater. In extreme cases, plants may die and springs and wetlands may disappear. Pumping of groundwater must be done with caution, anticipating the impacts that this pumping may have on local stakeholders, both natural and anthropogenic. The allowable capture must be that which can be maintained without causing unacceptable environmental, ecological, economic, or social consequences. There is an urgent need for interdisciplinary synthesis in groundwater resource evaluation, to include ecology, surface-water hydrology, and the economics of natural resources. Across the landscape, plants get the water they need from various sources, including surface and subsurface water. Surface water occurs in the form of ponds, lakes, streams, and rivers. 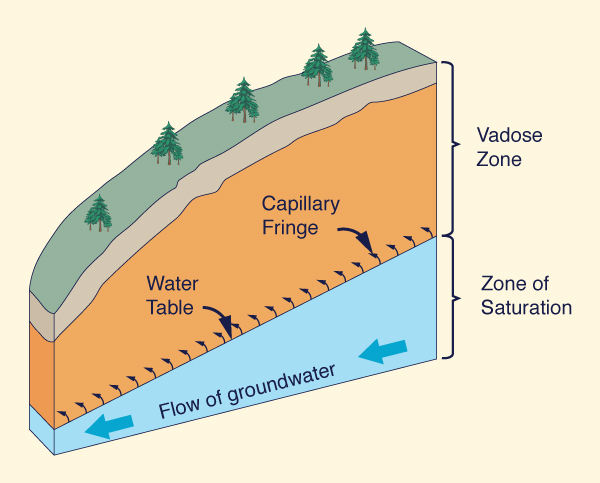 Subsurface water lies below the ground surface, first in the unsaturated or vadose zone and, secondly, below the water table, in the zone of saturation (Fig. 1). The capillary fringe, the thickness of which depends on soil texture, is located immediately above the zone of saturation. Fig. 1 Vadose zone and zone of saturation in subsurface flow. At a given location, the source of water used by vegetation depends on the prevailing climate and the local geology and geomorphology. In arid climates, certain types of vegetation get their water exclusively from groundwater. Indeed, a host of desert plants are known to pump groundwater, which may lower the water table, albeit temporarily. Enter contemporary humans. Over the past century, developed human societies have learned to tap groundwater for various uses. Thus, the question arises: Are humans in competition with plants for the groundwater resource? Would excessive well pumping affect the health of vegetative ecosystems, particularly in arid regions where some plants are known to rely solely on groundwater? These are relevant questions, because the health of arid vegetative ecosystems is at stake. The latter provide a host of natural services, including carbon fixation, erosion control, wildlife habitat, contaminant filtering, low albedo, and scenic beauty (Ponce et al., 2000).1 These services may be impaired by the excessive pumping of groundwater. In this article we look at these issues from an interdisciplinary perspective and examine ways of reaching a suitable compromise. To understand where water comes from, how much of it is already committed by Nature, and how much may be available for human use, we must take a close look at the hydrologic cycle. Water originates in the oceans, evaporates into the atmosphere and moves inland, eventually to precipitate and convert into runoff, returning to the ocean to complete the cycle (Fig. 2). Fig. 2 The hydrologic cycle. While on land, runoff separates into surface water and subsurface water. In turn, subsurface water is of two types: (1) unsaturated flow, and (2) saturated flow. Unsaturated subsurface flow lies within the vadose zone; saturated subsurface flow lies within the zone of saturation (Fig. 1). The thickness of the vadose zone depends primarily on the prevailing climate and, to a lesser extent, on the local geomorphology. In humid climates, the water table is generally close to the ground surface, while in arid climates it may lie at greatly varying depths. For instance, Meinzer (1927) has documented depths to the water table in the arid/semiarid western United States varying between 1 ft (0.3 m) and 62 ft (18.9 m). Significantly, Meinzer's data predates the intensive groundwater development that has taken place in the Western United States in the past 50 years. Groundwater differs from surface water in two important respects: Quantity and quality. Surface water runs off the ground readily to join adjacent streams and rivers, or else, it collects in natural depressions (swamps and lakes) where it becomes available for evaporation. In contrast, groundwater has been accumulating in the Earth's crust through geologic time, while slowly flowing toward the nearest ocean. Chebotarev (1955) has estimated the thickness of the water-bearing crust as the upper part of the lithosphere, consisting of the loose products of disintegration of igneous and metamorphic rocks, with a depth of approximately 10 miles (16 km). Fig. 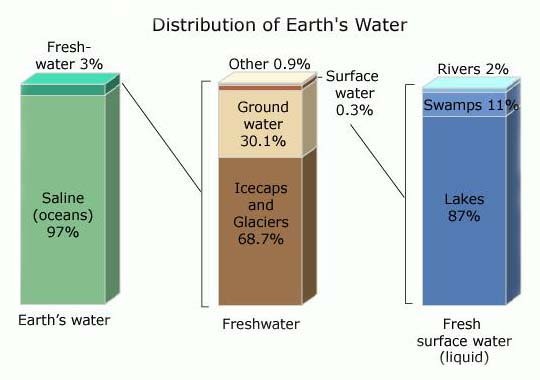 3 Distribution of Earth's water. Age is perhaps the most significant difference between surface water and groundwater. On a global basis, surface water recycles every 9 to 16 days, with an average of 11 days (World Water Balance, 1978; L'vovich, 1979). Evaporation, evapotranspiration and surface runoff are the agents responsible for the relatively fast cycling of surface water. Thus, surface water is completely renewable in the short term. The deeper the groundwater, the older it is and, consequently, the more saline it is likely to be. Unlike surface water, groundwater does not recycle readily. Rates of groundwater turnover vary from days to years, and from centuries to millennia, depending on aquifer location, type, depth, properties, and connectivity. The average time for the renewal of groundwater is 1,400 years (World Water Balance, 1978). Shorter renewal times tend to be associated with shallow groundwater, while longer renewal times are associated with deep groundwater (Fig. 4). Significantly, renewal rates of deep groundwater are about 1/15 of those of shallow groundwater (Jones, 1997). Yet some fossil, or paleogroundwaters may have ages exceeding 30,000 years. Old groundwaters are practically nonrenewable; once used, they are not likely to recharge any time soon. Fig. 4 Variation of groundwaters age with type of aquifer and depth. Thus, while surface water is entirely renewable, groundwater is not. The use of surface water is sustainable, while the use of groundwater may not be. Sustainability implies renewability; lack of renewability is deemed to be unsustainable. All vegetative ecosystems satisfy their need for water by drawing either surface or subsurface water. Some may rely on surface water, some others on vadose-zone water, and yet some others on groundwater. The mix generally depends of type of species, climate, soils, geology, and geomorphology. In humid regions, where the water table is close to the ground surface, plants may get their water from all sources; however, in arid regions, where surface water is scant, only plants that can successfully tap the groundwater may be able to survive the pervasive droughts. 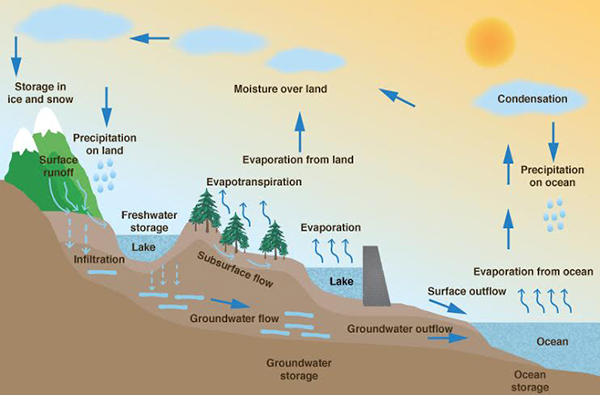 In humid regions, vegetative ecosystems are supported by surface and subsurface water, including groundwater, which lies at relatively shallow depths. In these regions, precipitation is plentiful, groundwater is abundant, and replenishment is fast. 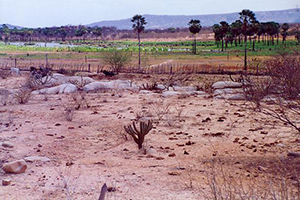 In arid regions, vegetative ecoystems are typically supported by groundwater. In these regions, precipitation is scant, groundwater is meager, and replenishment is slow. How does groundwater pumping affect arid vegetative ecosystems? The answer to this question demands a thorough grounding in concepts of geology, geomorphology, hydrology, and ecology. In the following sections we endeavor to examine these fields in search for effective ways of resolving the competition between well plants and pumping wells. Geology is the source of everything natural. Local geology interacts with the prevailing climate to condition the geomorphology. Geologic uplift is responsible for mountain building; in turn, mountains are eroded by the action of rain and gravity. The products of erosion are transported by runoff, eventually to settle in and fill the downstream valleys. In the valleys, within the voids in the soil structure. The accumulation of water below the ground surface, in aquifers, has been occurring through geologic time. Aquifers can be of two types: (1) fractured rock, and (2) alluvial. Fractured-rock aquifers are associated with mountains and uplands, where rain is abundant and there is an active groundwater recharge. Alluvial aquifers are present in the soil-filled valleys and lowlands, where groundwater discharge generally takes place (Fig. 5). Fig. 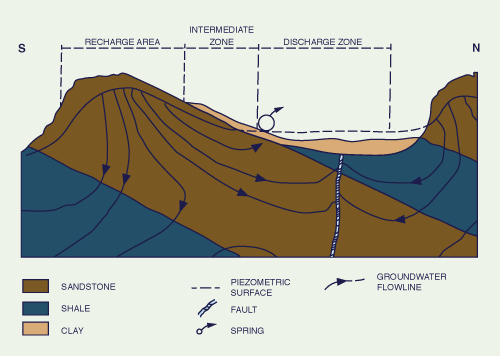 5 Typical location of recharge and discharge of groundwater. The relative storage volume is measured by the storage coefficient, i.e., the ratio of voids volume to total volume. Alluvial aquifers have comparatively large storage coefficients, generally varying in the range 0.01 - 0.30 (Freeze and Cherry, 1979). In contrast, fractured-rock aquifers have much smaller values, typically in the range 0.0001 - 0.01.
while that of alluvial aquifers may be measured in years and decades. Fig. 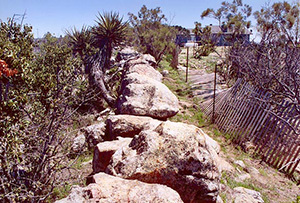 6 Typical fracture outcrop: McCain valley, San Diego County, California. Fractured-rock and alluvial aquifers differ in the predominant mode of exfiltration. Fractured-rock aquifers feature springs wherever fractures and the water table intersect at or near the ground surface (Fig. 7). Springs are related to the number, size, and connectivity of fractures; therefore, they reflect the local geology and tectonic activity. On the other hand, the exfiltration of alluvial aquifers is driven by the local geomorphology, as characterized by stream bottoms, surface depressions, grabens, and so on.5 Fractured-rock aquifers exfiltrate through springs; alluvial aquifers exfiltrate through the baseflow [the dry-weather flow] of streams and rivers. Fig. 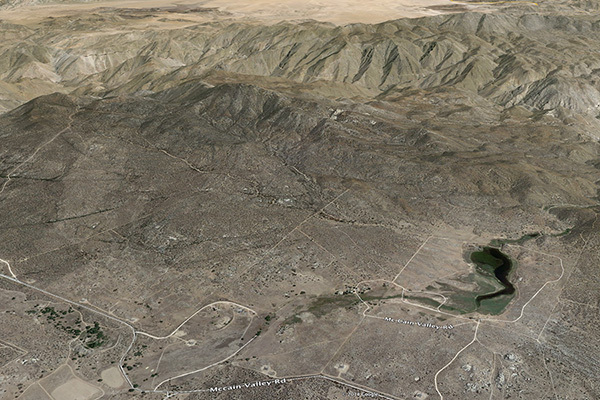 7 Large spring: McCain valley, San Diego County, California. The foregoing facts have a significant bearing upon the relation between groundwater and vegetation. Above a fractured-rock aquifer, plants will colonize the immediate vicinity of springs, which, for the most part, are randomly distributed. This "upland interaction" between plants and groundwater takes place ostensibly in the absence of a clearly defined stream channel. Conversely, in an alluvial aquifer, plants are known to colonize the immediate vicinity of streams, where the groundwater is shallowest. This "riparian interaction" takes place between plants and groundwater in the presence of a stream channel. Figure 8 shows a typical example of upland vs riparian interaction between groundwater and vegetation. This infrared image depicts a portion of Tierra del Sol, in eastern San Diego County, California. Two branches of Tierra del Sol Creek are shown, featuring a riparian community of coast live oak (Quercus agrifolia) [shown in red color], sparsely populated along the two ephemeral stream channels. Also shown (on the bottom right) is a tightly packed upland linear forest of red shank (Adenostoma sparsifolium), which is fed by water exfiltrating through a fracture in the underlying rock (Ponce, 2006). Tierra del Sol, San Diego County, California. If geology may be considered the father of ecosystems, geomorphology can be taken as the mother. The analogy is quite fitting, because while geology contributes the required nutrients, geomorphology helps in the nourishment by facilitating access to a permanent source of water [groundwater]. Climate determines the average depth to the water table; geomorphology determines the actual depth. 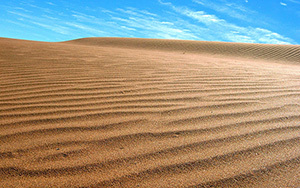 In humid regions, the water table lies close to the surface, while in arid regions it lies at greater and varying depths. geomorphology determines the actual depth. In Nature, geology, geomorphology, hydrology, and ecology are thoroughly intertwined into a complex web of relations whose sole purpose is to sustain the vegetative ecosystems. Significantly, geomorphology stands out as the glue that effectively ties all the other components together. The role of geomorphology is nowhere more marked than in arid regions, where it determines whether a plant or ecosystem will exist or not. 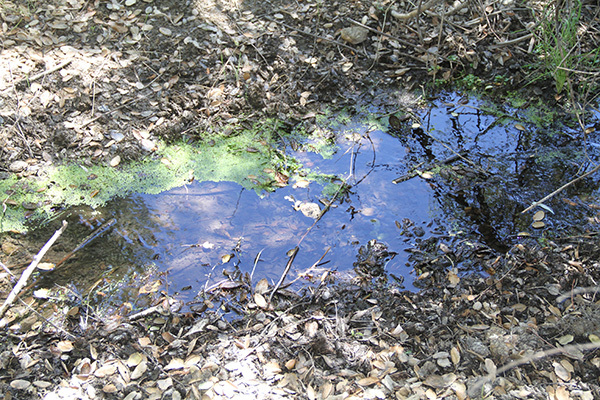 An example or such determinacy is an oasis, a depression where the groundwater comes close enough to the surface to be within reach of the vegetation (Fig. 9). Fig. 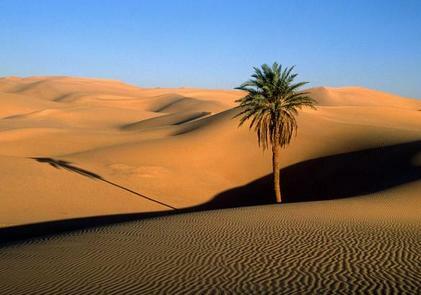 9 An oasis in the Sahara desert. In certain places, depending on the local geology and geomorphology, exfiltration may be of such magnitude as to feed small lakes embedded in otherwise desertic landscapes. For instance, Fig. 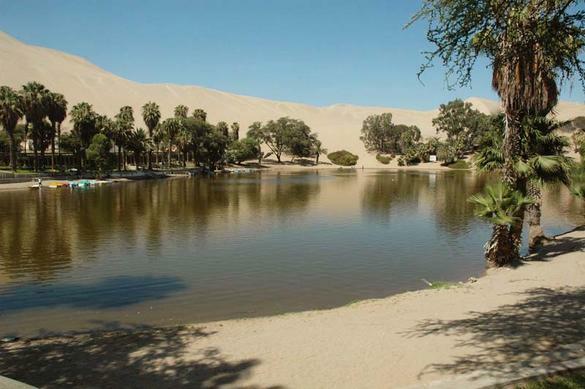 10 shows the Huacachina Lagoon, an oasis near Ica, Peru. Groundwater exfiltrates into this natural depression, located within Peru's coastal desert. Fig. 10 The Huacachina Lagoon, an oasis near Ica, Peru. "... The largest areas of plants that feed on groundwater are in the valley lowlands, but distinctive plants of this group also grow in higher tracts where they are reliable indicators of [the presence of] groundwater. The native plants found in these tracts of shallow groundwater are not the same species as grow elsewhere in the desert, but consist of a few distinctive species which dominate the shallow-water tracts and are absent or have only very sparse growth in other parts of the desert where the water table is not near the surface." Figure 11 shows the vegetational gradient along a cross section of the Mohave river valley at Camp Cady, California (Meinzer, 1927). It is seen that different species occupy different levels in the profile. The dimensions of the terraces depend on the proximity to groundwater, which is conditioned by the local topography, i.e., by the geomorphology. Fig. 11 Vegetational gradient along a cross section of the Mohave river valley at Camp Cady, California. Vegetational gradients of the type shown in Fig. 11 are not restricted to the arid landscapes described by Meinzer (op. cit.). 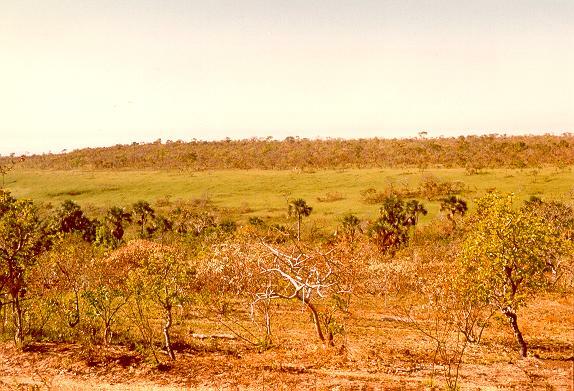 Figure 12 shows the sequence of cerrado-campo-gallery forest which recurs in the subhumid, highly dissected savannah woodlands of Mato Grosso, in central western Brazil. The cerrado (dense scrub forest) occupies the higher ground, out of reach of the groundwater. The campo (grassland) occupies the middle ground, subject to occasional flooding. The gallery forest occupies the lower ground, where there is a significant and active interaction with groundwater (Ponce and Cunha, 1993). Fig. 12 Vegetational gradient in the savannah woodlands of Mato Grosso, Brazil. In summary, geomorphology helps explain the presence of different types of vegetation across a dissected landscape. In particular, in arid regions the depth of the vadose zone and, consequently, the proximity to the water table, are conditioned by local geomorphology. Thus, geology and geomorphology are the primary agents determining which ecosystems are able to survive and thrive, and where. Soil texture, which affects the thickness (depth) of the capillary fringe, acts as a secondary factor. Hydrology encompasses all the waters of the Earth, including those that flow on the surface and below the surface. Surface water and groundwater have quite distinct physical and chemical properties; however, the differences appear to end there, because one can convert into the other, and vice versa. Infiltration is the mechanism for surface water to become groundwater; conversely, exfiltration is the mechanism for groundwater to become surface water. (b) A perennial stream: Feather river, Plumas County, California. Streams with characteristics in between those of ephemeral and perennial are referred to as intermittent (Fig. 14). These streams may have baseflow only during the wet [or rainy] season. Fig. 14 An intermittent stream: Gila river, Arizona. Surface runoff consists of direct and indirect runoff. Direct runoff flows on the surface; indirect runoff flows below the surface. Direct runoff converts to flood flows, while indirect runoff winds up as baseflow. Thus, flood flows and baseflow are seen to be mutually exclusive. Flood flows and baseflow are seen to be mutually exclusive. Fig. 15 The Amazon river at Obidós, Pará, Brazil. Fig. 16 The Pirai river, Santa Cruz, Bolivia. Hydrology, groundwater, and vegetation. The relative quantities of surface and subsurface runoff affect the relation between groundwater and vegetation. When the ratio of surface runoff to total runoff is large, most of the water is flowing on the surface. Conversely, when the ratio of surface runoff to total runoff is small, most of the water is flowing below the surface, as baseflow. Large quantities of baseflow are made possible by a shallow water table. In turn, this leads to a substantial interaction between vegetation and groundwater. In this case, plants are not limited by lack of water, being able to use all types of water, including surface water, vadose water, and groundwater proper. A total absence of baseflow implies a water table below the stream bottom, sometimes at a great depth. In this case, plants do not use surface water; instead, they send their roots, often to great depths, to tap the underlying groundwater (Fig. 17). These are the phreatophytes documented by Meinzer (1927). In summary, local climate, geology, geomorphology, and hydrology interact to either foster or discourage the development of vegetation. In particular, in semiarid and arid regions, more often than not, the presence of phreatophytes is an indication of the proximity of groundwater. In these cases, the depth to the water table may vary from a few feet to as much as 50 to 60 feet (Meinzer, 1927) (Fig. 18). showing the deep roots of mesquite (Prosopis sp.). Ecology deals with the interactions between organisms and their environment. An ecosystem, the basic unit of ecology, consists of living (biotic) and non-living (abiotic) components. Living components are the plants, animals, and microbes. Non-living components include the surrounding air, water, nutrients, soil and rock. Solar energy enters ecosystems through the process of photosynthesis, by which green plants take carbon dioxide from the air and water from the surrounding environment to manufacture organic matter in the presence of light. The reaction releases oxygen as a byproduct, which enters the atmosphere. Through respiration, which is the exact biochemical opposite of photosynthesis, animals obtain the energy necessary for their livelihood by burning organic matter (food) using oxygen from the air (for combustion) and releasing carbon dioxide as a byproduct. The atmosphere acts as the reservoir which provides both the carbon dioxide for the plants and the oxygen for the animals. 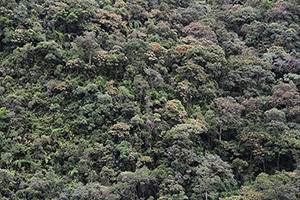 (b) A humid tropical montane forest, Zamora-Chinchipe, Ecuador. A plant community may be described either floristically (the plant species) or physiognomically (the plant's appearance). The floristic description refers to the various vegetative species present in the community. The physiognomic description focuses on the physical structure of the community, its characteristic height, canopy density, and specimen size (trunk diameter at breast height). Plants require inputs of solar energy, carbon dioxide, water, and nutrients. Solar energy varies primarily with latitude; plants in tropical and temperate regions are able to get their energy needs during the day or, significantly, during the growing season. Carbon dioxide exists in the air in concentrations that are sufficient for plants to avail themselves of as much carbon and oxygen as needed (Bolin, 1970). Therefore, the limiting factors are water and nutrients (Ponce, 2008). Hydroecology deals with the relations between plants and water. In Nature, water and nutrients are tied together. Water serves as the means to carry the nutrients to the plant. Without nutrients, the construction of the biosphere would come to a halt; without water, photosynthesis and biomass production could not take place. 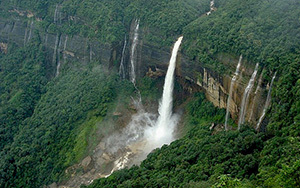 (b) The wettest spot on Earth: Cherrapunji, Maghalaya, India. The tallest trees. 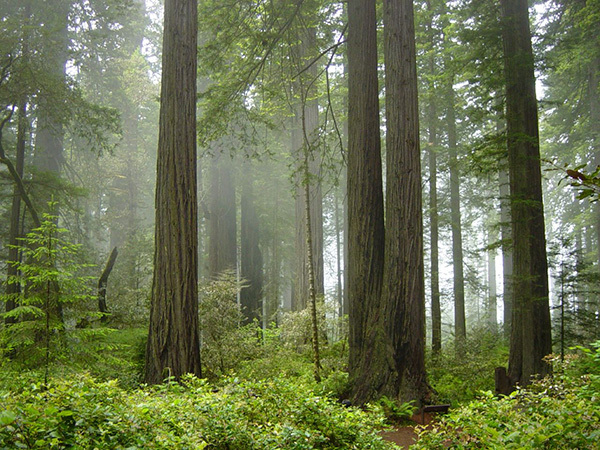 The tallest [and oldest] trees on Earth are the California (coastal) redwoods (Sequoia sempervirens) (Fig. 21). The coastal redwood is a long-lived evergreen tree, living 1,200-1,800 years or more. The species includes the tallest trees of record, measuring up to 379 ft (115.5 m) in height and up to 26 ft (7.9 m) in diameter at breast height. Its natural habitat is coastal northern California, particularly in Humboldt and Del Norte counties, where mean annual precipitation reaches 125 in (3,175 mm), the largest in California. Its natural habitat extends to the adjoining southern coast of Oregon. Fig. 21 The California redwoods, showing the all-important fog. The coastal redwoods usually grow in the mountains, where precipitation from the incoming ocean moisture is maximized. The tallest and oldest trees are found in deep valleys and gullies, where there are year-round streams and fog drip is regular.6 Trees located above the fog layer, above about 2,300 ft (700 m), are shorter and smaller due to the drier, windier, and colder conditions. The widest tree. 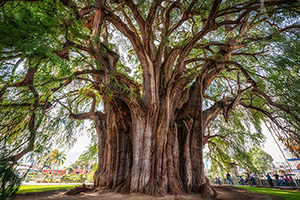 The widest tree in the world is a Montezuma cypress (Taxodium mucronatum) located in Santa Maria del Tule, about 6 mi (9 km) east of the city of Oaxaca, Mexico [Fig. 22 (a)]. In 2005, its trunk had a circumference of 137.8 ft (42 m), which represents a diameter of 43.9 ft (13.4 m). The best estimate for the age of this tree, based on growth rates, is 1,433 to 1,600 years. Fig. 22 The widest tree in the world: (a) ground view; (b) aerial view of vicinity. The tropical rainforests. All vegetation responds readily to moisture inputs from all sources, including surface, soil, groundwater, and air. Absence of water is definitely limiting; on the other hand, ample water leads to trees of great size such as the California redwoods (Fig. 21). Too much water may lead to a dearth of nutrients, due to soil leaching through geologic time. However, large tropical forests such as the Amazon are able to store nutrients in their extensive canopy and recycle them as appropriate (Fig. 23). Fig. 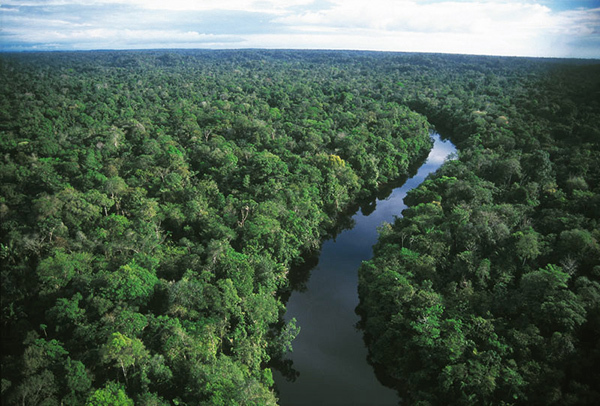 23 The Amazon rainforest. The deserts. The preceeding examples have shown conclusively that the presence of water has a direct bearing on the physiognomy (height and density) of vegetation. This fact is nowhere clearer than in a desert landscape, where the size differences may be attributed to the prevailing gradient in the depth to the water table. For instance, Brown (1923) has documented the height of mesquite (Prosopis sp.) 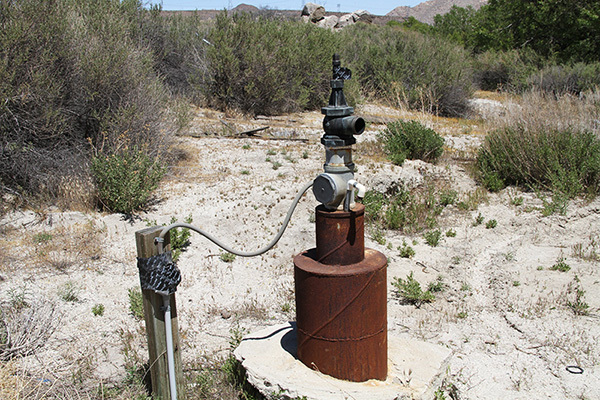 between two wells located in the Coachella valley, near the Salton Sea, California (Fig. 24). Mesquite grows as a dense forest 10 to 25 ft high along the eastern well, and of somewhat less size (6 to 8 ft) on high sand dunes to the west. Within a distance of 2 miles, from east to west, the depth to the water table increases from 32 ft to 75 ft. Ostensibly, mesquite does not grow beyond a depth to the water table of 50 ft.
in the Coachella valley, California (Brown, 1923). Fig. 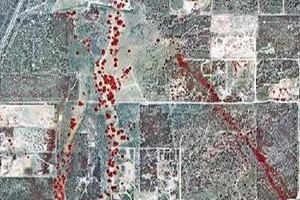 25 (a) Aerial view of the linear forest of red shank; (b) Closeup of the red shank forest. Two closely related chaparral species, chamise (Adenostoma fasciculatum) and red shank (Adenostoma sparsifolium) are significantly represented in Tierra del Sol. Although congeners, these two species are not at all alike in appearance. 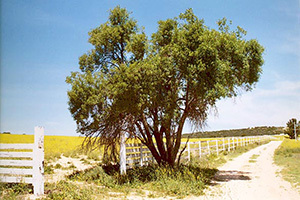 Stands of chamise chaparral are dull, dark-green in color and uniform in appearance. The mature chamise plant is a medium-sized shrub 2 to 8 feet tall, with sparse leaf litter. In contrast, red shank is a tall, round-topped arborescent plant 6 to 18 feet high, with thick, naked stems and considerable leaf litter, 0.5 to 2 inches in depth. Red shank appears to dominate over chamise on sites with higher moisture content, organic matter, and nutrient availability (Beatty, 1984). 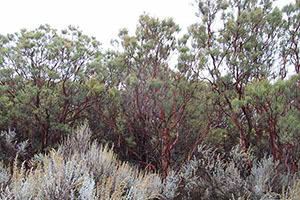 Despite being sclerophyllous, red shank can be shown to violate several definitions of sclerophyllous plants. First, red shank remains physiologically active during summer drought; thus, it is drought tolerant without being drought dormant (Hanes, 1965). Secondly, its root morphology is unique among the chaparral. Its shallow root system suggests that its moisture for summer growth must come from the top layers of the substrate. Red shank seems to be a type of shrub well adapted to drought conditions, but lacking the obvious morphological characteristics suggesting such adaptability (Shreve, 1934). Thus, the water affinities of red shank lie in between those of the xerophytes, which are well adapted to drought, and those of the mesophytes, which habitually require a more sustained moisture source. In semiarid regions, this ecological niche must be connected to the presence of groundwater or, at the very least, to plenty of vadose moisture, which suggests a close proximity to groundwater. The water affinities of red shank lie in between those of the xerophytes, which are well adapted to drought, and those of the mesophytes, which habitually require a more sustained moisture source. The linear forests of fractured-rock aquifers are similar to the oasis in that both exfiltrate groundwater. The linear forests are indeed the loci of groundwater exfiltration through the fractures. This confirms the importance of geology in a rock aquifer, in contrast to geomorphology in an alluvial aquifer. Hydrogeology deals with the distribution and movement of groundwater in the soil and rocks of the Earth's crust. The main objective is to determine the amount of groundwater that is possible to extract from an aquifer, by pumping, without causing undesirable or unacceptable consequences. Other environmental and socioeconomic costs, which are much harder to quantify. Water table depletion, progressibly making it harder for all users of the aquifer to pump groundwater. Loss of wetlands, including possible impairment of oasis, phreatophytic, and spring-fed vegetation. Loss of baseflow and riparian corridors, which may trigger changes in channel morphology and lead to streambank erosion and increased sediment loads. Land subsidence; for instance, see the Las Vegas experience (Fig. 28) (Galloway et al., 2013). Salt-water intrusion in coastal environments. Fig. 27 Other costs or impacts of excessive groundwater utilization. (From Pavelko et al. : Las Vegas, Nevada, in U.S. Geological Survey Circular 1182). Groundwater flow systems. A groundwater flow system may consist of one or more aquifers of different types. The aerial extent of groundwater flow systems varies from a few square miles or less to tens of thousands of square miles. The length of groundwater flow paths ranges from a few feet to tens, and sometimes hundreds, of miles. A deep groundwater flow system with long flow paths between areas of recharge and discharge may be overlain by, and in hydraulic connection with, several shallow, more localized, flow systems. Thus, the definition of a groundwater flow system is to some extent subjective and depends in part on the scale of the study (Alley et al., 1999). Aquifers. 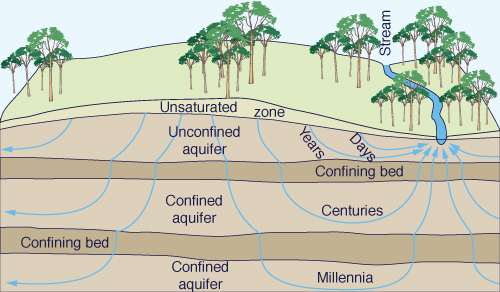 Aquifers may be of two types: (1) unconfined, and (2) confined. Unconfined aquifers lie near the surface and, for the most part, constitute shallow groundwater. Confined aquifers lie at greater depths, below a confining layer and often under pressure. Confined aquifers may constitute either shallow or deep groundwater, depending on the characteristics of the regional groundwater flow system (Fig. 29). Fig. 29 Conceptual hydrological flow system in the coastal plains of Georgia. Depending on their geologic age, aquifers may be tertiary or quaternary. Tertiary aquifers can lie near the surface or at greater depths, and can be confined or unconfined. They are composed of rock, either igneous or sedimentary. Depending on their depth and connectivity, tertiary aquifers may contain either shallow or deep groundwater, or both. Quaternary aquifers lie within alluvial, glacial, or lacustrine deposits. They consist primarily of unconsolidated materials such as sand and gravel, but may also have some silt and clay. These aquifers are usually surficial (superficial); they flow through soils deposited throughout the Quaternary Period.8 These aquifers are either unconfined or confined, and contain, for the most part, shallow groundwater. Wells. Wells can be of three types: (1) water table well, (2) artesian well, and (3) flowing artesian well (Fig. 30). In a water table well, the water table is at atmospheric pressure; in an artesian well, the water pressure is greater than atmospheric; in a flowing artesian well, the water pressure is such that it can flow freely above the ground surface. Fig. 30 Types of wells. Pumping from a water table well lowers the groundwater levels near the well. The affected zone is known as the cone of depression, and the land surface above it, its area of influence. Well pumping changes the natural direction and amount of groundwater flow within the area of influence. 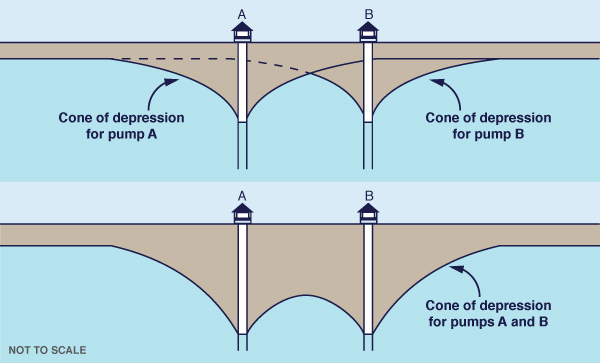 If two cones of depression overlap, the interference reduces the water available to each well (Fig. 31). Well interference can be a problem when many wells are competing for the water of the same aquifer, particularly at the same depth. Fig. 31 Cone of depression, area of influence, and well interference. In cases where the area of influence of a well extends to a nearby stream or lake, there is a reversal in the flow direction and the water body begins to lose water to the well by induced recharge. Streams, wetlands, and lakes can dry up completely under sustained conditions of induced recharge. Taking out [capturing] all the water that enters the control volume effectively means taking out most, if not all, the water that exits the control volume. Thus, downstream uses stand to be impaired. The latter includes wetlands, the baseflow of streams and rivers, and established riparian water rights, to name a few (Sophocleous, 2000). Sustainable yield. Over the past two decades, the concept of safe yield has been superseded by that of sustainable yield (Alley et al., 1999). The latter seeks to strike a compromise between safe yield, which purportedly uses all the recharge, and zero yield, which conserves all the groundwater. Sustainable socioeconomic yield allows the pumping of groundwater, but only up to a limit. Significantly, this limit is imposed, not based on hydrogeologic analysis, but rather on environmental and socioeconomic considerations (Ponce, 2007). The overall objective is to determine the percentage of recharge that may be pumped at a given location, without significantly affecting local stakeholders. The latter include the wetlands, baseflow, and those individuals or entities affected by the loss of riparian rights, land subsidence and/or salt-water intrusion. The aim is to limit/regulate the lowering of the water table, to which all the other factors are related. A depleted system, typically in nonequilibrium state, where pumping equals [increasing amounts of] captured recharge plus captured discharge plus captured storage. Fig. 32 Stages in the development of groundwater systems. Developed and depleted groundwater systems [Fig. 32 (b) and (c), respectively] generally result in a lowering of the water table. The greater the amount of capture, the greater the amount of depletion. Thus, sustainable groundwater systems aim to make sure that the lowering of the water table does not cause undesirable or unacceptable consequences (Alley et al., 1999). In practice, this requirement effectively limits groundwater pumping to a small percentage of the [gross] recharge (Ponce, 2012b). It is clear that both plants and wells pump groundwater; this fact has been amply confirmed by theory and experience. The two systems, one natural (plants) and the other anthropogenic (wells), when located in close proximity of each other, are actually drawing water from the same reservoir (Fig. 33). Therefore, the question arises: Are wells in competition with the plants for the groundwater resource? If well pumping results in a lowering of the water table within reach of the roots, the answer is an unequivocal Yes. wells are in competition with the plants for the groundwater resource. Fig. 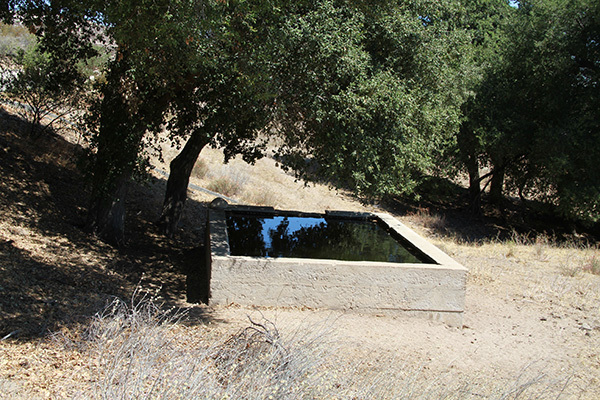 33 Jacumba community well: Jacumba, San Diego County, California. Sites that remain close to pristine state are probably impacted to a relatively small degree. Developed sites, where the water table has been lowered an average amount, may have been somewhat negatively impacted. Depleted sites, where the water table has been lowered a large amount, are probably severely impacted. Capture is defined as the amount of groundwater that is removed through pumping and not returned or put back into the aquifer. Capture that results in substantial water table lowering (depletion) has a host of negative effects, or impacts. The spatial and temporal reach of these impacts varies with the affected system and the amount of capture [See box below]. 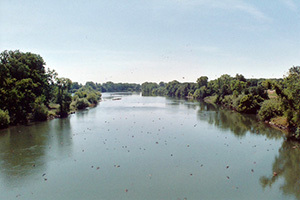 In alluvial aquifers: riparian vegetation, which relies on the local water table. In fractured-rock aquifers: the upland vegetation that is sustained by exfiltration along fractures and springs. Loss of baseflow, due to the lowering of the regional water table below the level of the streambed. Additional soil loss, as intermittent streams are gradually converted into ephemeral streams, with consequent channel widening and streambank erosion. In all aquifers: an increase, in time, in the number of dry wells in the vicinity, due to the progressive depletion of the water table. In compressible alluvial aquifers: land subsidence increasing in time, as the regional water table is depleted beyond a sustainable limit. 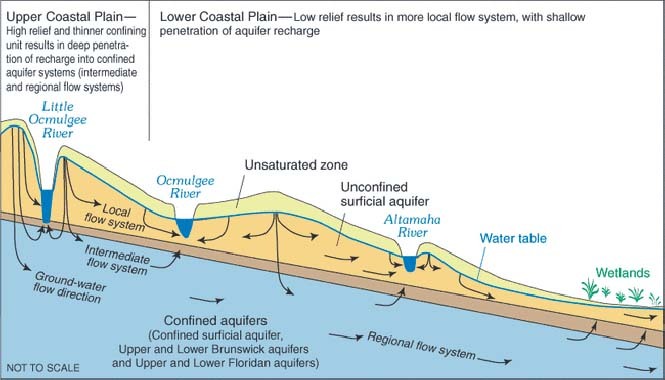 In coastal aquifers: salt-water intrusion, as the cone of depression produced by pumping reverses the hydraulic gradient, enabling ocean water to move inland. In conclusion, plants and wells are seen to be in competition for the groundwater resource, particularly in semiarid and arid regions, where groundwater may be the only source of water for most plants. Phreatophytes are counting on the groundwater for their livelihood, and if the groundwater table is lowered beyond their reach by anthropogenic action, they will eventually die and, therefore, cease to provide a host of natural services. Both riparian and upland ecosystems are likely to be negatively impacted by groundwater pumping. Riparian ecosystems are typically longitudinal, along the stream, and tap the water table in the dissected-and-filled alluvial landscape. On the other hand, upland ecosystems, particularly in mountainous regions, are more likely to be randomly distributed and to follow the fractures and springs (Fig. 34). In semiarid/arid landscapes, the situation may be more acute because of the limited number of springs. Fig. 34 Boxed spring in the Heath Ranch: Tierra del Sol, San Diego County, California. Lowering of the water table as a result of pumping will encroach upon the livelihood of many desert vegetative species. The mesophytes will be particularly affected, since these typically require substantial amounts of water.12 The latter flows in springs and under depressions, following paths established by local geology and geomorphology. 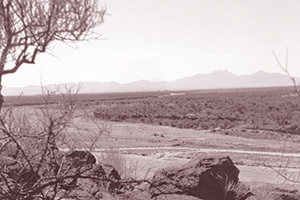 Santa Cruz River, Arizona: Depletion of groundwater beyond root reach caused the eventual disappearance of the riparian vegetation and the resulting widening of the stream channel. 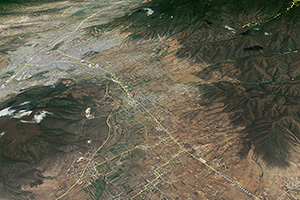 Ojos Negros Valley, Baja California, Mexico: Depletion of groundwater to support intensive agricultural development caused a major wetland to disappear almost entirely. 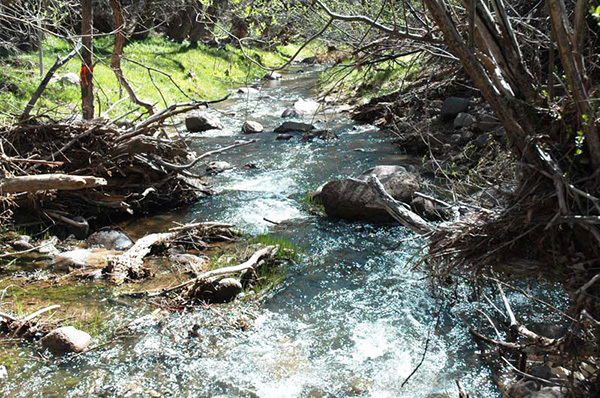 Ash Creek and Sawyer Spring, Utah: Intensive pumping for irrigation development led to the conversion of a small stream from perennial to intermittent, and to the impairment in the health of riparian ecosystems. 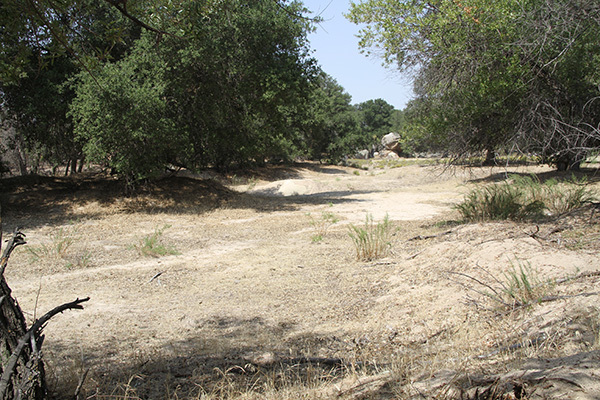 Thompson Creek, San Diego County, California: Protracted groundwater depletion led to the disappearance of a spring, which may have contributed to the impairment in riparian vegetation. Tierra del Sol, San Diego County, California: Groundwater capture in a fractured-rock aquifer, to support energy infrastructure development, affects spring-fed linear forests, threatening their demise. McCain Valley, San Diego County, California: Proposed groundwater capture in a desert environment, to support solar energy development, threatens to affect a relic forest of coast live oak. 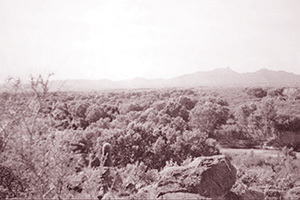 Two repeat photographs of the Santa Cruz river at Martinez Hill, south of Tucson, Arizona, are shown in Fig. 35 (Day et al., 2003).13 The photo to the left (1942) shows well established stands of mesquite and cottonwood along the river banks, indicating that sufficient moisture to support this type of vegetation had existed in the soil at that time. 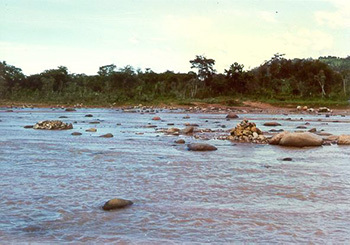 The photo to the right (1989) shows that the riparian vegetation has all but disappeared. Fig. 35 Repeat photographs of the Santa Cruz river at Martinez Hill, south of Tucson, Arizona. Beginning in 1940, and through the 1980s, groundwater pumping to support population growth in the Tucson and Phoenix metropolitan areas resulted in a substantial drop in the water table in the flood plain, with concomitant losses of riparian vegetation. Data from two nearby wells indicates that the water table had declined, due to pumping, up to 120 ft (36 m) during the stated period (Webb et al., 2007). 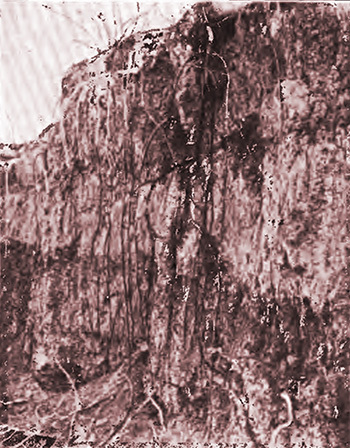 Significantly, Meinzer (1927) has pointed out that the roots of mesquite on the flood plain of the Santa Cruz river could reach a maximum depth of 60 ft (18 m). Therefore, it appears very likely that the protracted pumping was responsible for the eventual demise of the riparian vegetation. A significant example of groundwater depletion and related loss of wetlands and natural vegetation is the Ojos Negros valley, located about 25 mi (40 km) east of Ensenada, Baja California, Mexico. Beginning around 1970 and following through the present time (2014), the water table in the valley has dropped an average of 139 ft (42.5 m).14 The groundwater is being used to support intensive agricultural development (Ojos Negros Research Group, 2003). The experience of the Ojos Negros valley is particularly instructive, because the valley derives its name (Spanish for "Black Eyes") from two oval-shaped ponds that existed in the valley prior to the development of groundwater. In Fig. 36, each one is labeled "sienega" (sic), to mean cienaga (pond). These ponds have since dried out and disappeared in the face of protracted aquifer depletion. 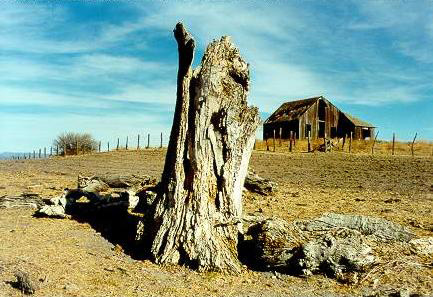 As late as 1999, a dead alamo cottonwood, relic of the vanished wetland, still remained in the valley (Fig. 37). that gave their name to the Ojos Negros valley (1864). Ojos Negros valley, Baja California, Mexico (1999). The experience of Ash Creek and Sawyer Spring, in Utah, constitutes a well documented example of the relation between groundwater pumping and the health of riparian vegetation. Ash Creek and its tributary, Sawyer Spring, are located near New Harmony, in Washington County, Utah, about 15 mi south of Cedar City. The streams drain a shallow alluvial aquifer and the fractured-rock aquifer of the Pine Valley Mountains to the west. 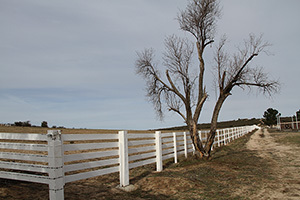 The proprietor of a farm located downstream of Sawyer Spring, owned the rights to all the surface flow of Sawyer Spring and a portion of that of Ash Creek. These rights amounted to 2.18 cfs in Sawyer Creek and 7.5 cfs in Ash Creek. Another owner held the property upstream, in the vicinity of Sawyer Spring and Ash Creek. In 1993, the upstream owner drilled a 12-inch diameter irrigation well near Ash Creek, to a depth of 600 ft. In the three-year period between 1993 and 1996, the 12-in well was pumped continuously at a rate of 750 gpm, during the irrigation season. In 1997, the discharge at this well was increased to 1,700 gpm. Drawdown from this rate of discharge eliminated surface flow in Sawyer Spring and greatly diminished that of Ash Creek. 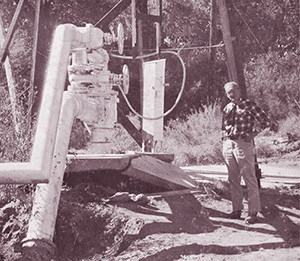 As a result of pumping, Sawyer Spring, which had been perennial until at least 1993, became intermittent [or much reduced in flow] and dried up every year since the pumping was increased to 1,700 gpm. 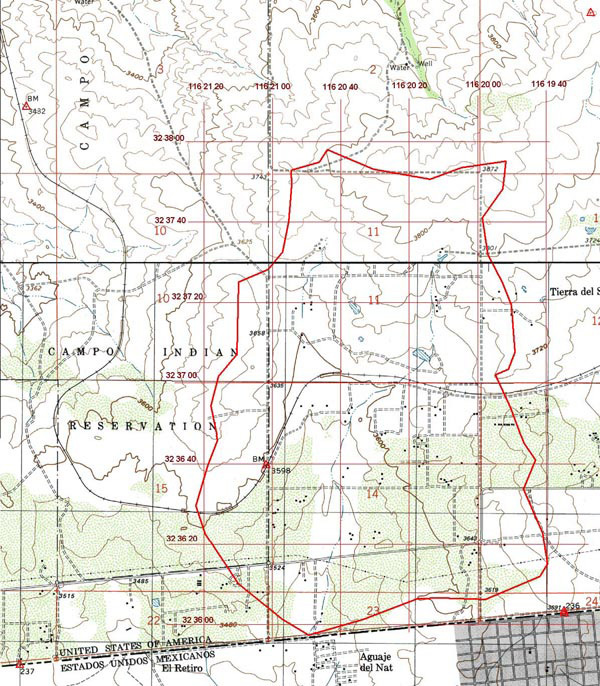 In 2003, the downstream owner sued the upstream owner claiming that groundwater pumping at the 12-in well interfered with the natural baseflow of Sawyer Spring and Ash Creek. Riparian vegetation along Sawyer Spring and Ash Creek has been adversely affected by the lowering of the water table. Many trees either died or were substantially impaired in their normal growth and development (Fig. 38). Fig. 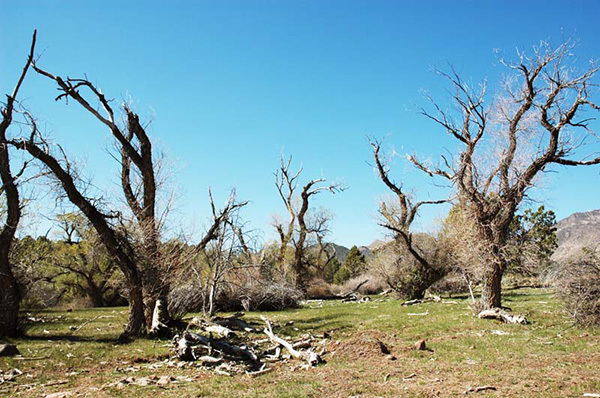 38 Dead riparian trees near Ash Creek, Washington County, Utah (2008). In October 2007, in response to the controversy over water rights, the upstream owner stopped pumping at the 12-in well. 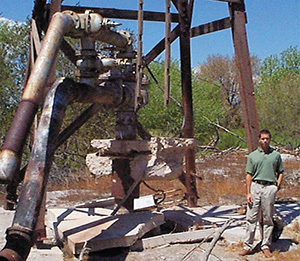 By the spring of 2008, baseflow had recovered in Sawyer Spring and Ash Creek in response to the interruption of pumping from the 12-in well (Fig. 39). Fig. 39 Ash Creek on May 2, 2008, showing baseflow recovery. Thompson Creek is located in the rural area of Poway, in San Diego County, California. The mean annual recharge to groundwater in the basin has been estimated to be 205 ac-ft. In the period 2001-2011, annual groundwater capture, including all uses, has totaled 224 ac-ft on the average, i.e., about 109% of recharge.16 As a result of this intensive pumping, the depletion of the water table in three wells [which the longest and most reliable record] has been measured at 275 ft (2012) (Ponce, 2012b). Fig. 40 Confluence of Thompson Creek with Sycamore Creek: (a) aerial view; (b) geologic map. While the same type of aquifer underlies both Thompson and Sycamore creeks, their riparian health appears to be at variance. Figure 40 shows that while Sycamore Creek (left) appears sufficiently healthy, the same does not hold for Lower Thompson Creek (right). Thompson Creek's riparian vegetation is somewhat healthy to the east, but not near its confluence with Sycamore Creek. The combined effect of urban development, wildland fire, and groundwater depletion may be surmised. 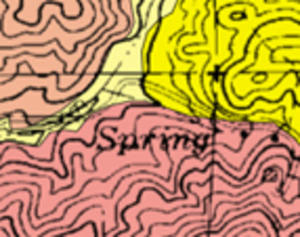 Significantly, the geologic map of Thompson Creek has a clearly labeled Spring near Robert Myers' property (Fig. 41). 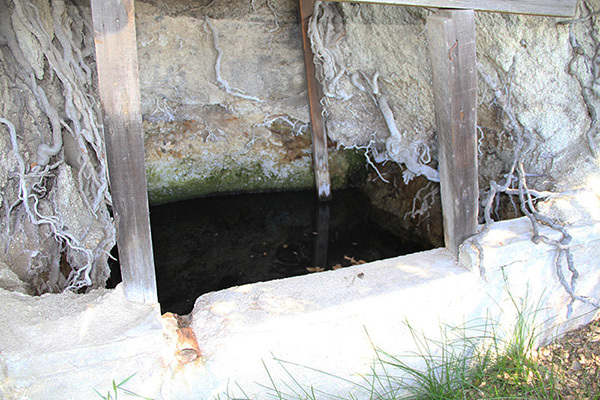 This is clear proof of the presence of a spring in the vicinity, prior to groundwater development. Myers himself recalls that in the spring of 1980, in the wake of three wet years (1978-1980), his well operated under flowing artesian conditions for three to four months.18 Therefore, the question is appropriate: "What happened to the spring?" close to the Myers property. The answer must lie in the capture, over the period 2001-2011, of annual groundwater volumes exceeding the natural recharge. In all probability, these large capture amounts led to the drying out of the spring, and may have contributed to the impairment in riparian vegetation along Thompson Creek. 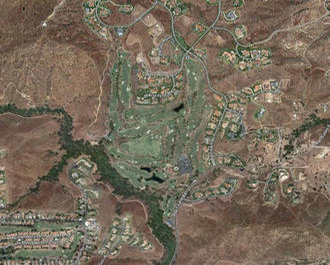 Tierra del Sol is on the southwest side of Boulevard, in southeastern San Diego County, California. Its west side, drained by Tierra del Sol Creek, occupies an area of 2.75 square miles, draining into Mexico at Aguaje del Nat (Fig. 42) (Ponce, 2006). To the west, Tierra del Sol abuts the Campo Indian reservation, which drains in a northwestern direction into Campo Creek, a tributary of the Tijuana river. The land use in Tierra del Sol is native chaparral, albeit with a substantial presence of phreatophytes along well defined moisture paths, and scattered mesophytes, ranch clearings and rural housing. Fig. 42 The watershed of Tierra del Sol Creek, next to the U.S.-Mexico border. The region is underlain by the Peninsular Range Batholith, which straddles the mountains of central Southern California. It lies within the La Posta pluton, a deep-seated igneous intrusion (Walawender et al., 1990). This pluton varies inward from rim to core, from a sphene-hornblende-biotite tonalite rim to a muscovite-biotite granodiorite core. The rocks are extensively fractured due to batholith cooling and tectonic uplift. Fig. 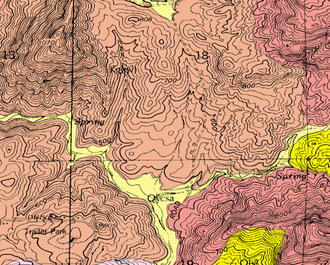 43 Map of photogeologic lineaments in the Tierra del Sol watershed. Figure 44 shows a large 180-ft long dike outcropping to the surface in the Morning Star Ranch. 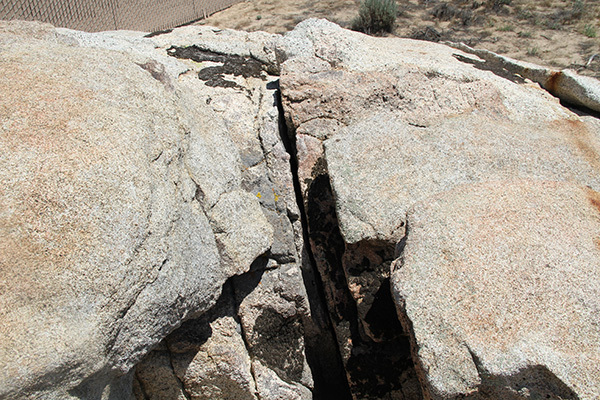 The existence of this dike became apparent in 2012, in the aftermath of the Shockey fire, which burned 2,566 acres in Boulevard and vicinity (CalFire, 2012). The presence of this geologic surface feature attests to preferred paths of groundwater flow in the area (see also Fig. 26). Fig. 44 A 180-ft dike in the Morning Star Ranch, Tierra del Sol. Immediately west of Tierra del Sol, within the Campo Indian reservation, extensive groundwater pumping for industrial uses has taken place from July to November 2013, in the middle of a persistent drought (2012-2014). A total of 84 million gallons of water have been used (until October 2014) in the construction of the SDG&E ECO Substation Project, in nearby Jacumba (Ponce, 2013a). Of this amount, about 12.2 million (37.44 ac-ft) was pumped from wells in the neighboring Campo Indian reservation (SDG&E, 2014). This pumping appears to have stressed the vegetation in the vicinity, particularly the mesophytes, which rely on moisture exfiltration through the fractures. Fig. 45 A specimen of blue eldelberry in the Morning Star Ranch, Tierra del Sol. 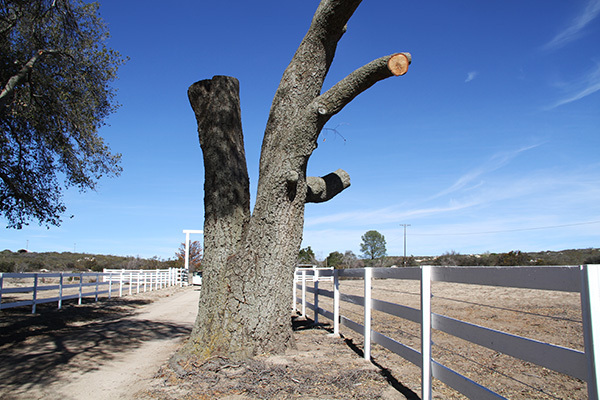 Figure 46 shows a dead coast live oak tree (Quercus agrifolia) on the entrance to the Morning Star Ranch. This tree is estimated to be at least 100 years old.23 The tree died in the past year, presumably due to moisture stress and/or other reasons closely related to moisture stress. San Diego County, California (November 2014). The McCain valley is located in Boulevard, in eastern San Diego County, California. 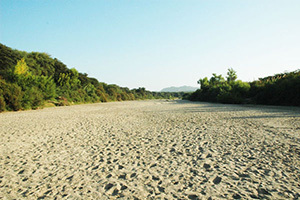 It is drained by Tule Creek, which flows east into Tule Lake, and then further east to join Carrizo Creek, in Carrizo Gorge, within the Anza-Borrego State Park. The valley is host to a singular community of coast live oak (Quercus agrifolia), at an elevation of 3,523 ft, in the vicinity of Mount Tule. The vegetative community is sustained by springs originating in Mount Tule, with peak elevation of 4,637 ft. Fig. 47 Aerial view of Mount Tule and environs, McCain valley, Boulevard. 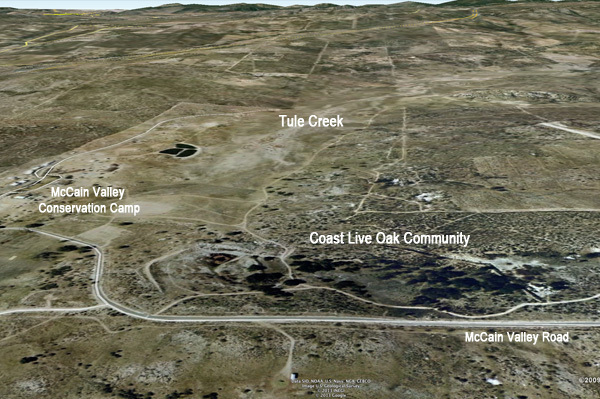 Figure 48 shows a perspective view of the coast live oak community. Within it, one extraordinarily large tree has been documented, with a circumference [at breast height] of 24.8 ft (7.55 m), and an equivalent diameter of 7.9 ft (2.41 m) (Fig. 49). The age of this tree is estimated to be 300 years.24 The existence of such an unusually large tree in this arid region indicates the presence of substantial moisture in the soil, within reach of the roots, and often exfiltrating to the surface (Fig. 7). Fig. 48 A community of coast live oak in the McCain valley. Fig. 49 A very large specimen of coast live oak. Fig. 50 Boxed spring located in the Manzanita reservation, along the McCain Valley foothills. Plans are underway by a solar energy company to utilize the groundwater resources of McCain valley . 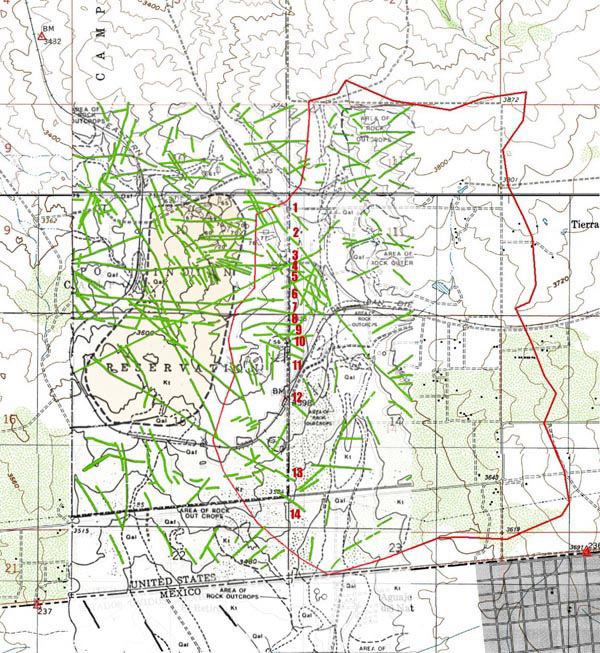 The Rugged Solar project is being proposed for development in Tule Creek and the surrounding floodplain, with project boundaries shown in Fig. 51 (Ponce, 2013b). For its water supply, the project intends to tap several existing wells in the vicinity. While the total construction water has been estimated at 73 ac-ft, the mean annual recharge has been conservatively estimated at 50 ac-ft.26 Capture amounts exceeding 100% of recharge are likely to substantially lower groundwater levels and, therefore, negatively affect upland spring-fed vegetation and riparian/wetland ecosystems in the vicinity. Fig. 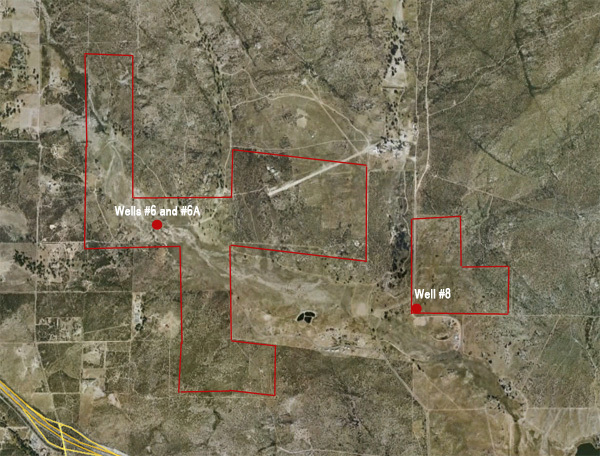 51 Location of existing wells within the Rugged Solar project site. Figure 51 shows that the distance between Well #8 and the nearest edge of the coast live oak community (situated immediately outside of the smaller red enclosure) is barely 760 ft (232 m). In light of the unique vegetation resources at stake in McCain valley, the proposed groundwater pumping must guarantee that it will not encroach upon existing springs and wetlands. No development, no matter how lofty its aim, should have the right to place in jeopardy the health of a singular live oak forest ecosystem such as that of McCain valley. What are plants useful for? Where is the competition between plants and wells most critical? Could a middle ground be found that uses groundwater without encroaching upon ecosystem health? There is not enough surface water to satisfy all the perceived needs or uses. Local groundwater is less expensive than imported surface water. The available surface water may have been all appropriated; thus, there is no other recourse but to tap the local groundwater. It is recognized that all groundwater of economic use is in transit to the surface waters; thus, the existence of groundwater as an additional resource is subject to interpretation. In many instances, groundwater is seen to be cheaper than surface water, but when all environmental costs are considered, the difference in cost may be reduced and possibly even reversed. While surface water is completely renewable, the same statement does not follow for groundwater. Therefore, usage of groundwater must be done with caution, anticipating and mitigating the impacts that this usage may have on local stakeholders, both natural and anthropogenic. ♦ What are plants useful for? Plants provide a host of natural services, many of which still remain to be quantified in conventional economic terms. First and foremost, all green plants sequester carbon dioxide, thus helping to control the climate. Thus, a permanent reduction in plant biomass has exactly the same effect as burning an additional amount of fossil fuels. In addition to carbon fixation and oxygen production, plants provide several other natural services, including erosion control, habitat for wildlife, filtering of contaminants, low albedo (which encourages rain), and scenic beauty, all of which have an intrinsic value. Thus, the impairment of ecosystem health by excessive groundwater pumping could have far-reaching consequences, that encompass aspects of climatology, biology, sedimentology, and public recreation. ♦ Where is the competition between plants and wells most critical? The competition between plants and wells is most critical in arid/semiarid environments, where many plants rely almost exclusively on groundwater. Thus, pumping in a desert environment is most crucial, not only because of the dependence of the vegetation on the groundwater resource, but also because replenishment is likely to be slow, with recharge events few and far between. A conundrum is noted here: Groundwater pumping may not be as crucial in a humid environment, because in this case surface water may be plentiful, largely eliminating the need for pumping. ♦ Could a middle ground be found that uses groundwater without encroaching upon ecosystem health? A middle ground may be found in the relatively new concept of sustainable yield. The amount of groundwater capture should not be based on the outdated hydrogeologic principle of safe yield. Instead, the allowable capture must be that which can be maintained [for an indefinite time] without causing unacceptable environmental, economic, or social consequences (Alley et al., 1999). These consequences would have to be carefully evaluated and accounted for in the economic analysis before the planned groundwater development takes place. The latter requirement calls for renewed interdisciplinary synthesis in groundwater resource evaluation, to include ecology, surface-water hydrology, and the economics of natural resources. Climate, geology, geomorphology, and hydrology interact to foster or discourage the development of vegetation. Many plants in arid/semiarid regions rely almost exclusively on groundwater to satisfy their basic need for water. The presence/absence of water has a direct bearing on the height, width, and type and density of vegetation. The concept of safe yield of groundwater has been widely discredited because it assumes that groundwater is a volume, when in fact it is a flow. In a pristine groundwater system, gross recharge equals gross discharge; therefore, net recharge is zero. Plants and wells are in competition for the groundwater resource; this competition is most critical in the arid/semiarid environment, where many plants are seen to rely almost exclusively on groundwater. Developed shallow groundwater systems generally result in a lowering of the water table; the greater the amount of groundwater capture, the greater the amount of lowering. All groundwater of economic use is in transit to the surface waters and may have already been committed; thus, the existence of groundwater as an additional resource is not always to be taken for granted. Riparian ecosystems (i.e., the gallery forests) are typically longitudinal, tapping the water table in the dissected-and-filled alluvial landscape. Upland ecosystems (for instance, the lineaments) are more likely to be randomly distributed in space and to follow fractures, springs, and/or other geologic features. Capture that results in a substantial lowering of the water table has a host of negative impacts, of which the most important is a [more or less] permanent reduction in plant biomass. A permanent reduction in plant biomass has exactly the same effect as burning an additional amount of fossil fuels, thereby increasing the carbon footprint. Usage of groundwater must be exercised with caution, anticipating the impacts that this usage may have on local stakeholders, both natural and anthropogenic. The allowable groundwater capture must be that which can be maintained [for a reasonably long time] without causing unacceptable environmental, ecological, economic, or social consequences. There is an urgent need for renewed interdisciplinary synthesis in groundwater resource evaluation, to include ecology, surface-water hydrology, and the economics of natural resources. The effect of groundwater pumping on the health of arid vegetative ecosystems is examined herein. Vegetative ecosystems are supported by a complex interaction of climate, geology, geomorphology, and hydrology. In arid/semiarid regions, many plants rely almost exclusively on groundwater to satisfy their basic needs for water. Globally, it is observed that the presence/absence of water has a direct bearing on the height, width, and type and density of vegetation. It is seen that plants and wells are in competition for the groundwater resource. The competition is most critical in arid/semiarid regions, where surface water is scarce and groundwater is the only recourse. Developed shallow groundwater systems generally result in the lowering of the water table, wherein the greater the capture, the greater the lowering. Lowering of the water table stresses the plants that customarily rely on the groundwater. In extreme cases, plants may die and springs and wetlands may disappear. Groundwater capture that results in a substantial lowering of the water table has a host of negative impacts, notably among them an increase in the carbon footprint. Pumping of groundwater must be performed with caution, anticipating the impacts that this pumping may have on local stakeholders, both natural and anthropogenic. The allowable capture must be that which can be maintained without causing unacceptable environmental, ecological, economic, or social consequences. There is an urgent need for interdisciplinary synthesis in groundwater resource evaluation, to include ecology, surface-water hydrology, and the economics of natural resources. 1 Albedo is the ratio of reflected radiation from a surface to incident radiation upon it. Vegetation has low albedos, ranging from 0.07 to 0.20, while bare soil has higher albedos, ranging from 0.20 to 0.60. 2 The carbon footprint is a measure of the amount of [anthropogenic] carbon dioxide (CO2) and other greenhouse gases emitted by a defined population. Burning of fossil fuels and land clearance (loss of vegetation) contribute to the carbon footprint. 3 Advection is a transport of a substance by a fluid due to the fluid's bulk motion. 4 Diffusion is the movement of a substance from a region of high concentration to a region of low concentration. 5 A graben is a depressed block of land bordered by parallel faults. 6 The condensation of coastal fog may account for a substantial portion of the water consumption of typical cloud forests. In extreme cases, it could exceed the amount of measured precipitation (Kiss and Bräuning, 2008). 7 A lineament is a linear feature of a landscape which expresses the location of an underlying geological structure such as a fault. Fracture zones and igneous intrusions such as dikes can also give rise to lineaments. 8 The Quaternary Period is the current and most recent period of the Cenozoic Era. It follows the Neocene Period and spans from 2.588 million years to the present. 9 In fluid mechanics, a control volume is a mathematical abstraction employed in the process of creating mathematical models of physical processes. In a fixed frame of reference, it is a volume in space through which the fluid flows. Unlike fluid mechanics, in groundwater flow the choice of control volume is not clearly defined, varying with the extent of capture; see, for instance, Prudic and Herman (1996). 10 In a seminal paper widely credited with originating the scientific study of groundwater, Theis (1940) wrote: "It is evident that on the average the rate of discharge from the aquifer during recent geologic time has been equal to the rate of input into it... Under natural conditions, therefore, previous to development by wells, aquifers are in a state of approximate dynamic equilibrium. Discharge by wells is thus a new discharge superimposed upon a previously stable system, and it must be balanced by an increase in the recharge of the aquifer, or by a decrease in the old natural discharge, or by a loss of storage in the aquifer, or by a combination of these." (Author's emphasis) (See Fig. 32). 11 By way of comparison, the total volume of groundwater pumping in the United States has been estimated to be about 8 percent of the natural recharge (Alley et al., 1999). 12 Mesophytes are terrestrial plants which are adapted to neither a particularly dry nor particularly wet environment. In arid and semiarid landscapes, mesophytes populate the areas close to sources of exfiltrating water, like springs and depressions. 13 Repeat photography consists of taking two images of the same site, with a time lag between the two images; a "then" and "now" view of a particular area, with aim to show changes. 14 As of November 2014, the depth to water table for the Ojos Negros aquifer was: maximum = 71.25 m; average = 42.48 m, minimum = 13.76 m (Data provided by Victor Hugo Vázquez García, manager of COTAS Ojos Negros, through the auspices of the Municipality of Ensenada). 15 The information contained in Section C was provided to the author [in 2008] by professional geologist Gary Player, who advised the downstream owner throughout the legal proceedings. Due to confidentiality reasons, no information about this case is available in the open literature. 16 Of the total amount captured, 73% is used for industrial purposes (a local golf course), and the remaining 27% is used for domestic consumption (individual home wells) (Ponce, 2012b). 17 The Holocene is a geologic epoch which began at the end of the Pleistocene (11,700 years ago) and continues to the present time. 18 Robert Myers, personal interview conducted on March 3, 2012. 19 Unlike surface-water flow, there no limit to the connectivity of groundwater flow. For instance, Prudic and Herman (1996) used the aquifer of Paradise Valley, in Humboldt County, Nevada, as an example of the evolving nature of groundwater capture. In a simulated experiment, they found that pumping 48% of the recharge for 300 years produced first losses in aquifer storage; then reduction in evapotranspiration; subsequently, decreases in flow discharge, and eventually, sizable downstream flow reversal, i.e., increases in recharge coming from the neighboring downstream basin. 20 The water affinities of the blue elderberry and its preeminent role as an indicator of the presence of groundwater have been known for more than one hundred years. Early references to the blue elderberry's moisture habits are scattered throughout the literature. Ball (1907) has stated that in Southwestern Nevada and Eastern California, the elderberry tree is unknown, except in the vicinity of water. Spalding (1909) has noted that the blue elderberry, while being structurally a flood-plain mesophyte, it is nevertheless very limited in its range, growing where there is an ample supply of moisture. 21 In a personal interview on December 13, 2004, Melody Pochot, a resident of the Morning Star Ranch, stated that in the past two years she had witnessed many of the eldelberry trees in the yard of her home become significantly moisture-stressed. 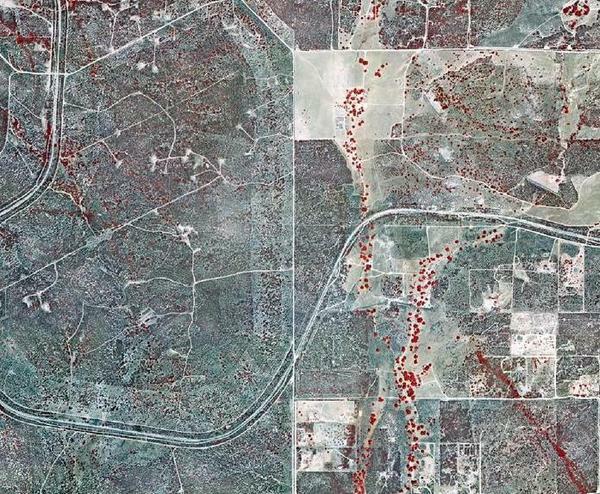 22 On December 13, 2014, a cursory inspection of the eldelberry trees in the Morning Star Ranch and immediate vicinity revealed than out of 61 trees surveyed, twenty-one (21) were either dead or near dead. 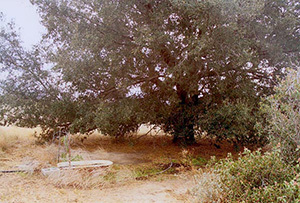 23 According to Donna Tisdale, the dead live oak tree shown in Fig. 51 was already well grown when her husband Ed bought the Morning Star ranch in 1963 (personnal communication on December 13, 2014). 24 Other studies suggest that the giant tree shown in Fig. 41 may be much older than 300 years. 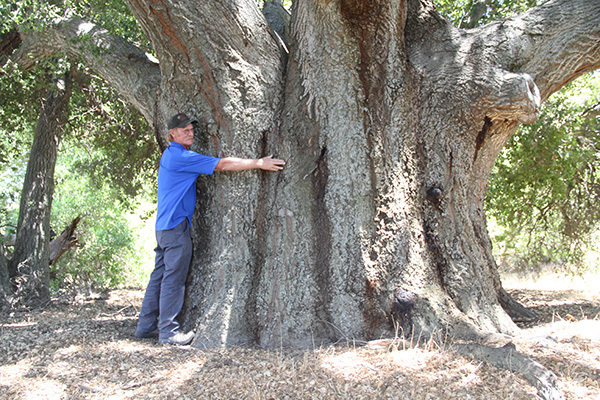 For instance, a specimen of coast live oak at Stanford University, with a trunk diameter of 55 in (1.4 m) was estimated to be 300 years old (Encyclopedia of Stanford trees, shrubs, and vines). The average rate of annual growth for the Stanford tree would be 0.0047 m. At this average rate of growth, the McCain Valley tree shown in Fig. 41 would be: 2.4 m / 0.0047 m/yr = 510 years old. 25 Interview with Donna Tisdale, on September 18, 2013. 26 There is no general agreement as to what constitutes the "control volume" on which to base recharge calculations. Thus, recharge estimations are only rough indications. Nevertheless, the practice of using the entire amount of recharge as "safe yield" has been widely discredited (Alley et al., 1999). This study was made possible by the support of the people of Tierra del Sol and Boulevard, in San Diego County, California. These folks are concerned that excessive development of the desert will end up encroaching upon their livelihood. Alley, W. M., T. E. Reilly, and. O. E. Franke. 1999. Sustainability of groundwater resources. U.S. Geological Survey Circular 1186, Denver, Colorado, 79 p.
Ball, S. H. 1907. A geologic reconnaisance of Southwestern Nevada and Eastern California. U.S. Geological Survey Bulletin No. 308, United States Government Printing Office, Washington, D.C.
Beatty, S. W. 1984. Vegetation and soil patterns in Southern California chaparral communities. In B. Dell, editor, Medecos IV: Proceedings, 4th International Conference on Mediterranean Ecosystems, August 13-17, 1984, The Botany Department, University of Western Australia, Nedlands, Australia, 4-5. Bolin, B. 1970. The carbon cycle. Scientific American, Vol. 223, No. 3, September, 124-132. Brown, O. 1923. The Salton Sea Region, California: A geographic, geologic, and hydrologic reconnaisance with a guide to desert watering places." U.S. Geological Survey Water-Supply Paper 497. Chebotarev, I. I. 1955. Metamorphism of natural waters in the crust of weathering. Geochimica et Cosmochimica Acta, Vol. 8, 22-48, 137-170, 198-212. Day, A., D. Eckstrom, S. Bronson, R. J. Carroll, and R. Elias. 2003. Pima County's withdrawal from its past. Sonora Desert Conservation Plan, Pima County, Arizona, 37 p.
Freeze, R. A., and J. A. Cherry. Groundwater. Prentice-Hall, Englewood Cliffs, New Jersey. Hanes, T. L. (1965). 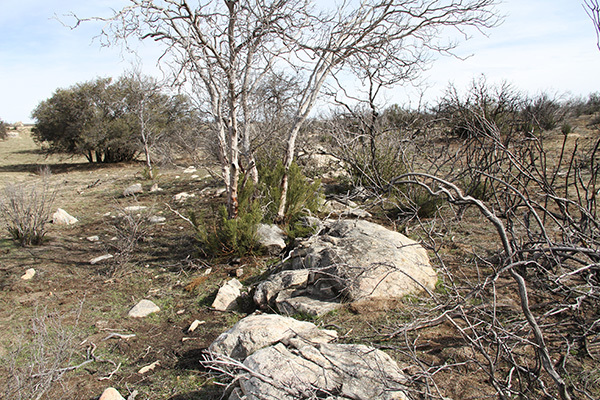 Ecological studies of two closely related chaparral shrubs in Southern California. Ecological Monographs, 35(2), 213-235. Galloway, D., D. R. Jones, and S. E. Ingebritsen. 2013. Land subsidence in the United States. U.S. Geological Survey Circular 1182, U.S. Department of Interior, Washington, D.C.
Jones, A. A. 1997. Global hydrology: Processes, resources, and environmental management. Longman, England. Kiss, K., and A. Bräuning. 2008. El bosque húmedo de montaña: Investigaciones sobre la diversidad de un ecosistema de montaña en el Sur del Ecuador. Proyecto de la Fundación Alemana para la Investigación Científica. Unidad de Investigación FOR 402, Loja, Ecuador, 64 p.
L'vovich, M. I. 1979. World water resources and their future. Translation from Russian by Raymond L. Nace, American Geophysical Union. Maimone, M. 2004. Defining and managing sustainable yield. Ground Water, Vol. 42, No.6, November-December, 809-814. Meinzer, O. E. 1927. Plants as indicators of ground water. U.S. Geological Survey Water Supply Paper 577. Ojos Negros Research Group. 2003. 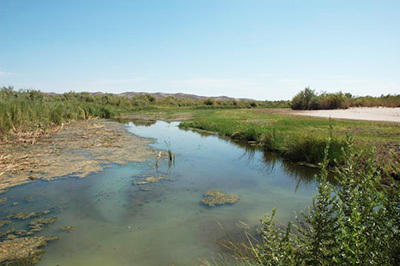 Sustainable management of water in the Ojos Negros valley, Baja California, Mexico. Online report, February. Ponce, V. M., and C. N. da Cunha. 1993. Vegetated earthmounds in tropical savannas of Central Brazil: A synthesis; with special reference to the Pantanal of Mato Grosso. Journal of Biogeography, Vol. 20, 219-225. Ponce, V. M. 1995. Management of floods and droughts in the semiarid Brazilian Northeast: The case for conservation. Journal of Soil and Water Conservation, Vol. 50, No. 5, September-October, 422-431. Ponce, V. M., A. K. Lohani, and P. T. Huston. 1997. Surface albedo and water resources: Hydroclimatological impact of human activities. ASCE Journal of Hydrologic Engineering, Vol. 2, No. 4, October, 197-203. Ponce, V. M., R. P. Pandey, and S. Ercan. 2000. Characterization of drought across climatic spectrum. Journal of Hydrologic Engineering, ASCE, Vol. 5, No. 2, April, 222-224. Ponce, V. M. 2006. Impact of the proposed Campo landfill on the hydrology of the Tierra del Sol watershed: A reference study. Online report, May. Ponce, V. M. 2007. Sustainable yield of groundwater. Online article. Ponce, V. M. 2011. The 800-mm isohyet. Online article. Ponce, V. M. 2012a. The salinity of groundwaters. Online article. Ponce, V. M. 2012b. Thompson Creek groundwater sustainability study. Online report. Ponce, V. M. 2013a. Cumulative impacts on water resources of large-scale energy projects in Boulevard and surrounding communities, San Diego County, California. Online report. Ponce, V. M. 2013b. Impact of Soitec solar projects on Boulevard and surrounding communities. Online report. Prudic, D. E., and M. E. Herman. 1996. Ground-water flow and simulated effects of development in Paradise Valley, a basin tributary to the Humboldt River, in Humboldt County, Nevada. U.S. Geological Survey Professional Paper 1409-F.
Seward, P., Y. Xu, and L. Brendock. (2006). Sustainable groundwater use, the capture principle, and adaptive management. Water SA, Vol. 32, No. 4, October, 473-482. Shreve, F. 1934. The problems of the desert. The Scientific Monthly, 38(3), March, 199-209. Sophocleous, M. 2000. From safe yield to sustainable development of water resources - The Kansas experience. Journal of Hydrology,Volume 235, Issues 1-2, August, 27-43. Spalding, V. M. 1909. Distribution and movement of desert plants. Publication No. 113, Carnegie Institution of Washington, Washington, D.C., 5-17. Theis, C. V. 1940. The source of water derived from wells: Essential factors controlling the response of an aquifer to development. Civil Engineering, Vol 10, No. 5, May, 277-280. Walawender, M. J., R. G. Gastil, J. P. Clinkenbeard, W. V. McCormick, B. G. Eastman, R. S. Wermicke, M. S. Wardlaw, S. H. Gunn, and B. M. Smith. (1990). Origin and evolution of the zoned La Posta-type plutons, eastern Peninsular Ranges batholith, Southern and Baja California. 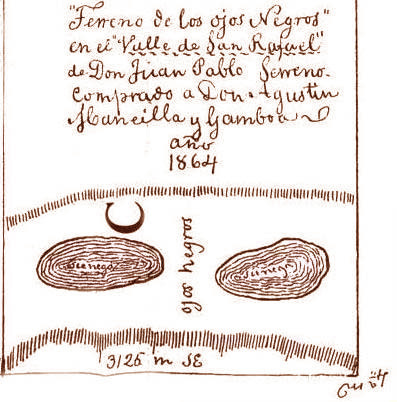 In "The Nature and Origin of Cordilleran Magmatism," J. Lawford Anderson, editor, Memoir 174, Geological Society of America, Boulder, Colorado. Webb, R. H., S. A. Leaky, and R. M. Turner. 2007. The Ribbon of Green. The University of Arizona Press, Tucson, Arizona. World Water Balance and Water Resources of the Earth. 1978. U.S.S.R. Committee for the International Hydrological Decade, UNESCO, Paris, France.